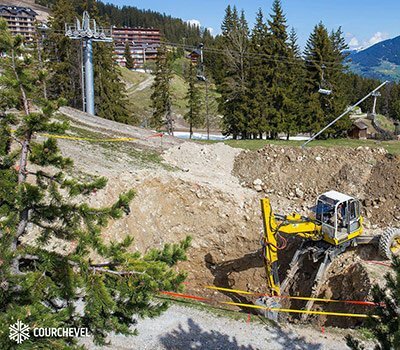 If you are ever planning to enjoy the French alps in summer my recommendation is NOT to go to a place that is principally a winter ski resort. Why? The place can be like a “ghost town”. Many of the big resorts make their money in the winter and the summer is sadly just an after-thought. This is clear when you find that most of the shops and cafes are all shut or at best just open from early July to the first week of September. I remember starting out from Val Thorens one August and couldn’t find a single cafe open for a coffee! Do you enjoy living in the midst of a building site? Another reason is that summer is just about the only time the resort can do construction and maintenance work. The result is sprouting cranes, concrete mixers and builders working frantically to complete new projects while the weather makes this feasible. Dust and noise may be your constant companion. Do you enjoy unspoilt nature. Ski lift pylons sprouting amongst the alpine pastures or the bulldozed ski runs partially partially covered with the grass that may have survived being covered in heavily compacted snow. Artificially produced snow from the “snow cannons” lining the side of the winter ski runs has a averse effect on the types of grass and flowers that will grow. Bull dozed tracks criss cross the ski area to allow maintenance of the ski paraphenalia. The only “developpement durable” here is the copious amounts of concrete. Up and down! Ski resorts may be high up with only one road up and down connecting them with the valley bottom. If you want to do anything else than stay in the immediate area of the resort that may be great but otherwise you will find yourself driving up and down the switch back roads to and fro from the valley bottom before being able to visit other neighbouring areas. Prices. As they say here the prices inflate along with the altitude. The “Huit a huit” superette, if it’s open, has a very limited stock along with high prices. The “Disneyland des Alpes” – to me Disneyland would be hell on earth and yet many ski resorts seem hellbent on the “Disneyfication” of the mountains. Sadly the winter ski clientele are largely composed of the “want it now”, “instant gratification” generation with no real “feeling” / connection with the mountains that need no man-made embellishment necessary. The epitomy of this “enfer” is the “Folie Douce” – outdoor discos on the ski slopes with pounding music with a bass that can be heard across the valley. This leaves aside the alcohol fuelled debauchery. No thanks. Here’s a few of some of my favourite places. Pralognan-la-Vanoise, Beaufort, Areches-Beaufort, Talloires. Previous Post: « Why go snowshoeing? Great post Mark, totally agree with it being a “Ghost Town”.